Russia is ready to grant asylum to former FBI Director James Comey if he is persecuted in the United States, President Vladimir Putin said. "He said he had recorded his conversation with President [Donald Trump] and handed over this recording to mass media with the help of a friend. This sounds strange. When a special service head records a conversation with the commander-in-chief and then gives it to the media through his friend. 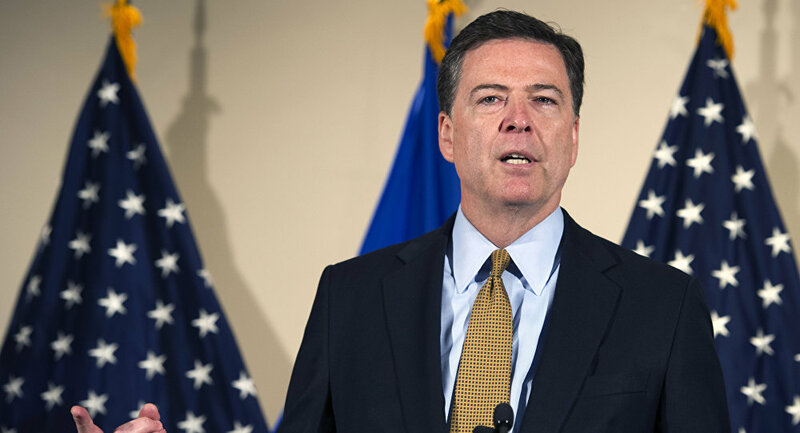 What is then the difference between the FBI director and [Edward] Snowden? Then he is not the head of a special service, he is a human rights activist defending a certain stance. If he [Comey] is persecuted, we are ready to grant him political asylum in Russia, he should know about it," Putin said. On June 8, Comey appeared for testimony on the Trump-Russia probe at the US Senate Intelligence Committee. He explained why he recorded his private talks with the US president, saying that he was afraid Trump might "lie" about them. However, he said that Trump did not directly order him stop investigation into former National Security Advisor Michael Flynn. "I am not familiar with the testimony given by Comey, the former head of the FBI, but I know some things, of course. What thoughts do I have about this? The first thing that I noticed, the former FBI director said that he believed that Russia's interference in the election process [in the US] took place, he did not provide any evidence in this case yet again. But, as he said, the influence on our [US] minds, and on how we should act, took place," Putin said. The president questioned if it was any different around the world. "And the constant US propaganda, the constant supply of NGOs oriented toward the US, and money is allocated directly for this, is this not an influence on our minds and not an attempt to influence how we should act during the election campaign? Yes, it continues from year to year. Take the globe, spin it around, poke with a finger in any place, there would be the US interests and there would definitely be their interference. I know this from conversations with almost all the heads of state. They just do not want to quarrel with the US side, no one directly talks of this," Putin added. The Russian president noted that according to Comey there was no evidence that Russia meddled with the vote count in the United States. "Thank God, this is something, this is good," Putin said.